The bedroom should be the one room in your home that is always inviting. It is the room that you wake up in and sleep. During the winter months as temperatures get cold you may notice that your bedroom could use some changes to make it feel more cozy, warm, and inviting. There are ways that you can improve the look and feel of your bedroom and if maintained take very little time and effort. You also do not need to dish out a whole lot of cash either to get the look and feel that you desire. 1. Take a minimal approach to get the clutter out. The floor or carpet should be mostly clear and wall decor limited. 2. Make your bed every day and don't forget your feet. There is nothing less cozy than having your feet chilling while hanging out of the covers. When making your bed tuck the top sheet as well as the base blanket in both sides of the bed as well as at the foot. 3. Place a few extra pillows on the bed. Don't go overboard though as you will end up wasting money since you really can only sleep with so many. 4. Fluffy bedside rug. This will give your floor a more cozier look and feel, especially when getting in and out of bed. 5. Set of lamps or wall mounted lights. Choose ones that will give off warm lighting. 6. Keep one chair in the room. A chair comes in handy for sitting in front of the mirror to style hair or or apply makeup. 7. Flannel sheets. Opt for warm rich colors that will give a more cozier feeling such as red, maroon, plum, or brown. 8. Down comforter. This is a great investment that will make your bed feel much more warm, snug, and comfy. 9. Add some warm scents. In a medium sized saucepan add in a mixture of sliced oranges (with the peelings, apple slices, cinnamon sticks, bay leaves, rosemary, and some water. Simmer until the aroma begins to fill the kitchen. Transfer the saucepan to the bedroom and leave for a few hours to allow the scents to spread well. 10. Place a potted plant near the bed to add some life to your room. Choose flowers that thrive well with minimum lighting. 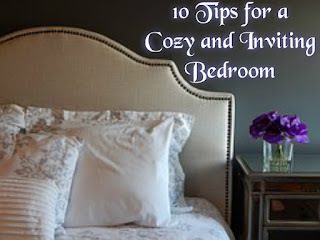 Do you have any tips for creating a more cozier and inviting bedroom? I don't believe in making my bed and never make it, but I am loving all your other tips. I love these tips. My bedroom needs a makeover. I like the sound of using rich colours for flannels in particular maroon or burgundy which are my favourite colours. The rich hue is perfect for this season too. I love these tips and seeing my bed made every morning. I think some warm scents and flannel sheets would be the trick for me. My wife is the one who makes the bed though so she would get the final input I'm sure. Awesome tips! Having a cozy bed definitely makes me sleep better at night. We really need a new bedding set. Once we get that I'll be making the bed. YES! I love fleece sheets in the winter time. They're so uber snuggly! Getting rid of clutter helps me feel so much more relaxed! A chair really does come in handy. You miss it if you take it out. I love these tips. Making up the bed upon rising is a must for my family. Great tips for starting the new year with a redesign. I love your tips, I think my bed needs a new makeover Lol. These are some great tips!! We just had to buy flannel sheets for this very reason! Great tips. We're hoping to do up our bedroom next year so I'll bear them in mind! Making your bed each day makes all the difference in the world. It's amazing the feeling of the room on the days I do vs. the ones I'm in a hurry and don't get it done. This is a great article with some very helpful tips. I live my chair and cannot imagine my room without it. Happy holidays to you.